A RED FLAG WARNING was issued today on March 4th, at 41056 hours MST until March 5, 2018 at 0200 hours MST. This is a CRITICAL FIRE WEATHER ALERT in how Conditions are expected today through Monday. Warm, dry and very windy conditions during the afternoon and early evening hours today ahead of and behind a strong cold front will again produce critical wildfire conditions. The critical conditions will encompass most of the plains as well as the southern foothills so the Red Flag Warning has been expanded. Southwest winds are expected to be ahead of the front will shift to the west/northwest and increase with gusts to around 45 mph as the front sweeps across the plains late in the afternoon. The shifting winds may produce erratic fire behavior and growth of any existing fires. Strong and gusty northwest winds and low relative humidity on Monday may again produce high fire danger on the plains on Monday. As a result, a Fire Weather Watch has been expanded to include all of northeast Colorado. Just after a RED FLAG WARNING was issued, Elbert County firefighters were dispatched to a fast-moving grass fire named the FOREST RIDGE FIRE. 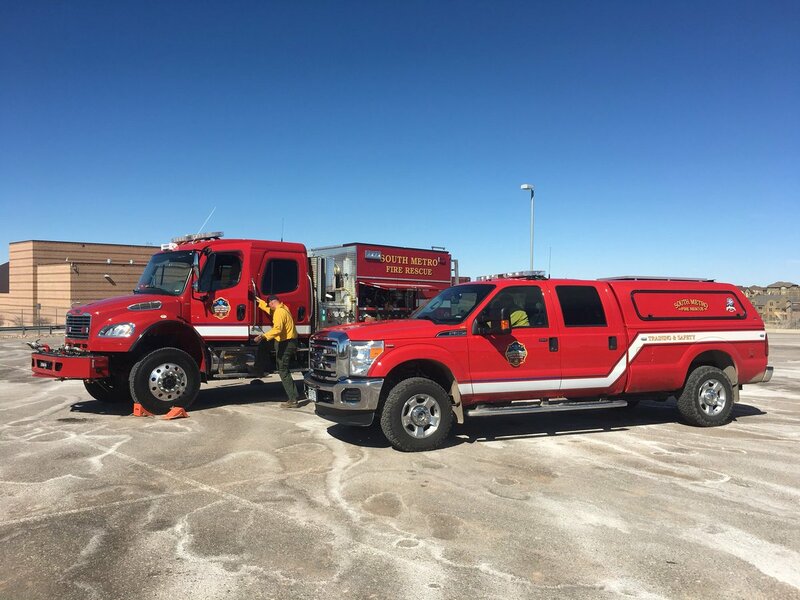 Due to high windy conditions, single engine air tankers or known commonly as SEATs based out of Rampart and Pueblo, so ground fire crews along with dozers, tenders and a Type-6 strike team were dispatched. The fire started at 1015 hours MST on Sunday, March 4, 2018. The fire originated on County Road (CR) 45 and CR 118, south of Kiowa, Colorado. Due to the high winds, the fire moved east. The fire had scorched an estimated 350-370 acres. Firefighters are still on-scene and have successfully reached an 80% containment status. Crews are still in progress of applying fire suppression efforts by working from the outer perimeter towards the center of the fire. Mandatory evacuations were issued and implemented by the Elbert County Sheriff’s Office for those homes between Maul road and west of CR 45 and between CR 118 and 110. Pre-evacuation notices were issued for those between Maul Road and CR 45 and south of CR 110 to CR 102. Those with livestock were evacuated to the Elbert County Fairgrounds in Kiowa. Elbert County officials say they are receiving requests on if donations are needed for fire victims but they say there are none needed at this time. Should this change, they will update those needs as more assessments are completed.